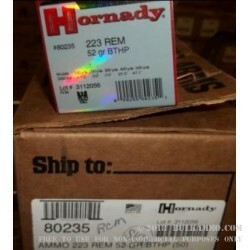 Hornady, the largest private ammunition company in the United States, has been producing high quality ammunition and cartridge components for over half a century. 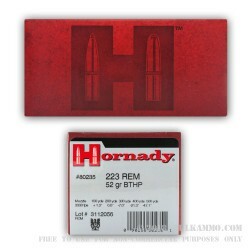 Police, soldiers and shooters all across the world trust Hornady for it’s reliability, accuracy and close tolerances. This .223 52 grain HPBT (hollow Point Boat Tailed) is ideal for varmint shooting, tactical training and self-defensive purposes. 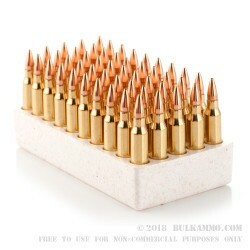 This ammunition can be used in bolt action .223 rifles as well as 5.56x45mm tactical rifles such as AR-15s and Mini-14s. 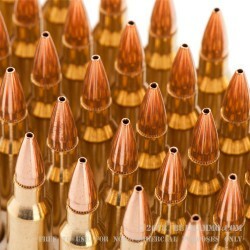 Ammunition is copper over lead and is loaded into brass casings. Muzzle velocity is over 3300 feet per second. Ammunition is brass cases and boxer primed. Fully reloadable. Q: Would this round be sufficient for coyotes and hogs in Texas? 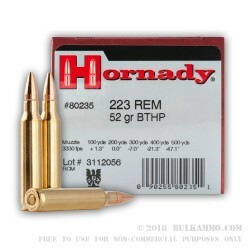 A: This Hornady ammo would work well for coyotes. However, hogs are generally tougher to kill than coyotes, and you might want to choose a more strongly constructed round that would allow for more penetration through tough muscle tissue. 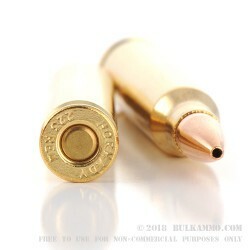 Heavier bullet weights, such as Hornady 75gr HPBT, or bonded bullet construction, such as Federal Fusion, would be a better choice for both coyotes and hogs. Q: I've read that for some scopes, it's better (read, more accurate) to use a round with a polymer tip. Is this really the case, or does it even make a difference? A: Not necessarily. 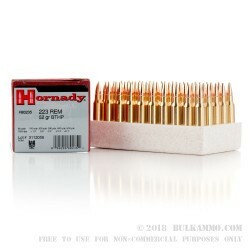 While polymer tip bullets are capable of great accuracy and precision, many long range shooting competitions are won with boat tailed hollow point bullets similar in design to this Hornady 52 gr BTHP load. The only way to tell which is better for you is to try each one in your rifle(s). A: Neither one is ideal for personal defense, although our choice would be the 52gr BTHP. 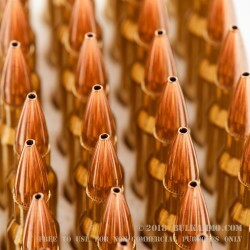 If your rifle can stabilize 69 or 75/77gr ammo, those would be our recommendations.